You have to take a boat from Batangas Pier. Take a metered cab to the bus station “Buendia Makati” on Taft Avenue (max 400P) then take a bus JACK or JAM liner (whoever is ready). The companies almost face each other, all the cab drivers know them. Fare is around 150P. Make sure that the bus is DIRECT and that you leave the bus station at maximum 1.30pm to catch the boat in batangas. 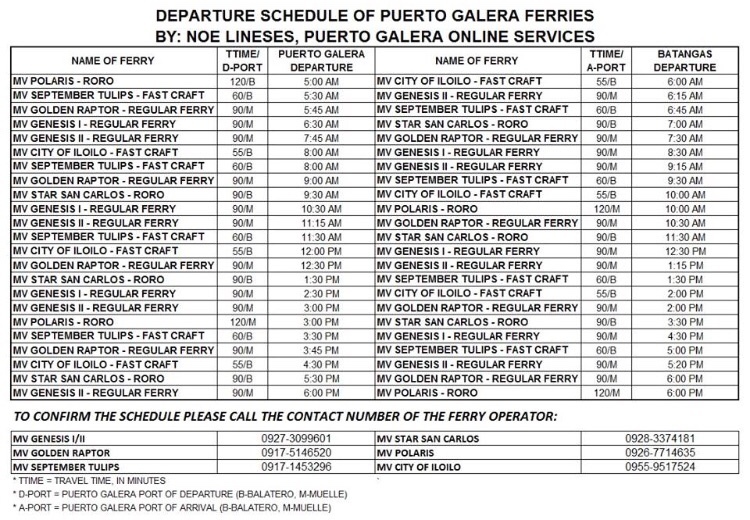 You can check below the boat schedule, PLS contact your preferred vessel company to confirm the trip.